Many iPhone, iPad, and iPod touch users are running iOS 9.1 through the beta program, and while there’s certainly nothing wrong with staying put in the iOS 9.1 seed, some users may wish to revert to iOS 9 instead for a variety of reasons. It should be pointed out downgrading is really not necessary for most, since iOS 9.1 is generally quite stable as is, nonetheless if you do want to run the final iOS 9 build instead this will get you there. If you’re familiar with downgrading, you’ll see that going to iOS 9 from iOS 9.1 is sort of similar to downgrading to iOS 8.4.1, except that you don’t need to download or use any IPSW files. You will need a computer with a new version of iTunes, and the devices charging USB cable, however. Note the process of reverting from iOS 9.1 to iOS 9 will also wipe the iPhone, iPad, or iPod touch. You will be able to restore from a prior backup if you have one that is compatible with iOS 9, however. If you don’t, you’ll likely want to stay on iOS 9.1. Once the device has been restored to iOS 9 from iOS 9.1, if you don’t want to receive any more beta versions on the device, you may want to go and delete the beta profile and unenroll the device from the beta program. Is this necessary? I’d argue no, if you’re on iOS 9.1 you might as well stay there, but some users may find they’d rather be on iOS 9.0 for a variety of reasons, whether it’s to leave the beta program and stop getting beta builds, for compatibility, troubleshooting, or anything else. And by the way, if you’re on iOS 9.1, you can also downgrade back to iOS 8 by using this method to revert from iOS 9 to iOS 8.4.1, but you will need to get the necessary firmware files for that. iPad Mini (1st gen.) w/iOS 9.1, the News app crashes on startup, doesn’t work at all. While it seems to have overall improvements to the last public beta of 9.0, I’m going back, as there was an update to the GM, so, maybe it’ll be just fine. Need a break from the betas for a while. Thanks for this, was trying to update by option clicking on Update, but, my newest .ipsw is way back to 8.0 for the iPad. yup, but, don’t need the .ipsw with the described method above, it downloads 9.0 .ipsw from Apple. I am on beta 9.1. Can’t I just remove myself from the beta program and then continue with the official release of either 9.1 or 9.2? yes, but you won’t see official release of 9.1 until iPad Pro is released in November (probably late November, unless it’s delayed until December). Thank you. That works fine for me. 9.1 beta is working fine for me. I just want to switch over to final releases when they come out. FYI for anyone doing this: So, one big problem, I tried this, got official 9.0 on my iPad, tried to restore backup but it would not allow me to as the software on my iPad is too old :( arg. Right, you can typically restore iCloud backups back a prior version but not iTunes backups. That is the big flaw with doing this, you clear your device and set it up as new if you don’t have a backup that is compatible. iOS 9.1 is stable though, little reason to go back to iOS 9 if you ask me. In this case, restoration from iCloud backup doesn’t work either! :( But it is true that 9.1 is stable for the moment. Agreed ! This article is basically driving its readers into the wall, because you won’t be able to restore your 9.1beta backup on your fresh 9.0 install. I had to reinstall 9.1 beta to restore my backup, and wasted hours. Thanks OS X Daily. I won’t upgrade ma beta anymore, but I am now wondering if i’ll be able to get off the beta when 9.1 will be released to the public. Don’t blame anyone else for your lack of reading comprehension. Bottom Line: Indeed IF you run the ‘beta’ code, and make a backup – to RESTORE your information from the beta device you (did!) make a backup of, you’ll 1st have to upgrade the “new” device and get it activated under the ‘beta’ program, then download/INSTALL the _SAME_ beta version you created your backups with or you will _NOT_ even SEE your backups in the list of files to restore from. (Lesson Learned:) Make TWO or MORE backups, if you’re using beta – and here’s why: I did exactly what I feel MOST would do – backup my data from my old 6 (running beta 9.x) bought the 6s and attempted to recover all the data inside from my backup to my new device. (Not “comprehending” – Pun intended!) It didn’t work – and because I had ‘create backups automagically’ checked, the 2nd time I attempted to recover, after re-plugging in my (new) 6s – did the (now NEW phone) create it’s OWN backup – which consisted of NOTHING but what comes out-of-the-box and was “the” only backup available to restore from. I was _lucky_ I made the 2nd backup on a 2nd machine – once I upgraded my new 6s to the beta code, _THEN) plugged it in to restore from my backup(s) was my “last backup” listed and I was (easily) able to restore ALL of my data. HEED THAT RECOMMENDATION if you’re a beta user. Finally – 9.x beta code, (with the exception of 9.1) has been working flawlessly for me on both the iPhone6 _and_ now my new 6s. Apple’s “beta” program is working out well, _for_me_ that is. (And I’m a very careful reader – I just don’t read the entire world-book-of-everything-there-is-to-read. I don’t feel that I have a “lack of reading comprehension” either. ) Humans, indeed can make mistakes – and (get this) sometimes _some_ people don’t WRITE correctly even if you DID read it ALL. It looks like your only options are either to revert to iOS9 and reinstall all of your data / applications, or to wait for the stable version of iOS 9.1, which will be released in November (if all goes to plan). Right that removes the beta profile which leaves the beta, but unless you restore to iOS 9 (or iOS 8.4.1) you will be stuck on the iOS 9.1 beta build. It’s a good idea to go to a stable build first, then leave the beta with the profile removal. How do you restore to iOS9? That is the purpose of this tutorial. Add a new issue.. My Apple ID was disabled after updating. Called apple, My ID is fine on Itunes, fine on the Apple site, but my IOS 9 upgrade disabled my Apple ID? Apple has no idea what happened? Figures! I’m also getting an “iPad is disabled” message after restoring iOS9.0. When I connect to iTunes, I press continue to allow my computer access, then get a message asking me to respond on iPad. However the iPad just continues to display the “”iPad is disabled” message and there is no way to respond! Hi Boldknight, I’m late to this conversation but the same thing happened to me! I stumbled upon this article looking for a way to fix it myself because I’m on my 4th call with Apple. Hopefully yours is fixed long by now! Any advice? Thanks! I downgraded from 9.1, and removed the beta profile. How can remove the software update badge though? It says 9.0 is the current version? I like trying new beta versions and iOS 9.1 is great but I don’t like not being able to backup my apps to iTunes. ( backing up on a beta only backs up basic data. Always like transferring purchase and backing up apps, as new apps arnt always better hence like to backup old versions. Ran into the same problem but after just retrying once more today, i suddenly could activate Whatsapp again. 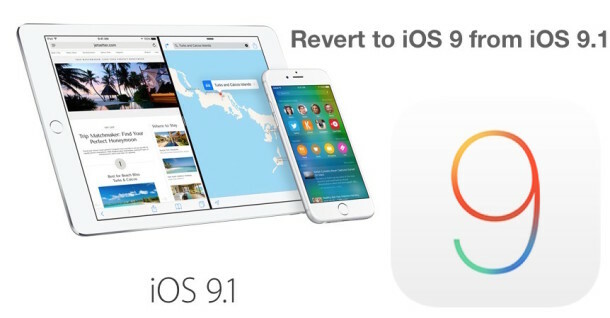 Valerie, I have a great article for you, it shows you how to downgrade from iOS 9.1 beta to iOS 9! You should read that, that tells you what to do. Here it is Valerie, just for you! im using IOS 9.1 beta 3 at the moment…apple is going to release ios 9.1 final soon in around october. The steps in this article do not work. You have to delete the beta profile on the phone FIRST, then restore. HOWEVER you will not be able to access any of your backups made while you were on the 9.1 beta code as they will be at the wrong level of IOS to restore. The best way I found is to set up the phone as new, then restore all of your apps and set it up with iCloud, etc as if it was a new phone. Actually it works exactly as described Mike, it sounds like you have a reading comprehension issue because I just downgraded from iOS 9.1 by restoring with iTunes no problem at all. You don’t know what you’re talking about Mike. Mike is wrong. I will update to iOS 9.1 when the final is out, but I bet Mike will claim it’s not possible too. I’m glad I found this site. I’m currently on IOS 9.1 beta version 5. I removed the beta and tried to restore from a back up I made whilst on beta. iTunes wouldn’t find the back up on the list of back ups so I had to re-install beta again. I want to try restore back up from iCloud instead? Will that work or will it be the same problem again? I have the the software update but I’m trying to erase it because it’s not letting me do important stuff.